The Crow really sparkles. Made up of a mostly black and red palette, there are always more shadows and dark silhouettes, than light. The cinematography is amazing, and the imagery alone is enough to put a twinkle in my eye. A certain character claims that it can't rain all the time, but none the less, it does so for the most of the film, peppering trash littered streets where hoodlums and lowlifes reign. Still the best comic book movie of all time. 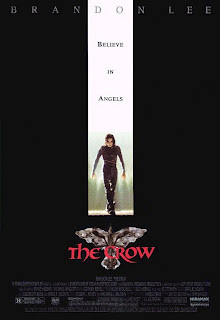 It kinda gets a bad rap for "only being famous because Brandon Lee was killed during filming", but even though Lee is awesome in this, the real stars were always the badguys, in my opinion. Top Dollar, T-Bird, Skank, Tin Tin, Funboy and even Gideon. They're all astoundingly awesome. I mean, they literary eat bullets for fun! That's just pure class. Michael Wincott's voice is out of this world, and when he does the whole bit about: "Greed is for amateurs. Disorder, chaos, anarchy: now that's fun!" DAMN that's probably the coolest sentence ever said in all of cinema history. And as a final topping, the great soundtrack serves as a line of coke in your ears. Whatever you do though, stay as far away from the sequels as possible.